Louie Zamperini just died. He was 97 years old. Soon we will all know his name because a film based on his life will be released at the end of this year. (With none other than Angelina Pitt Jolie directing it). But for us Laura Hillenbrand fans, Louie’s name has been etched in our minds for some time. And I can’t think of a better week for his candle to go out. Unbroken was the second book that Hillenbrand released. The first was Seabiscuit. Her books are few. But they are mighty. So mighty that when I got my book contract to write Finding Faith in the Dark, my editor said to me “There is one author you need to read before you start writing.” You can guess her name. He wanted me to read Unbroken so I would learn the fine art of telling a story. The fact that my husband, who is not a reader, got up at 5 am every day to read her book should tell you that she is indeed a master of her craft. But some of it was the material she was given in Louie’s life. Each of us is given one life, and we do our best to make it memorable. 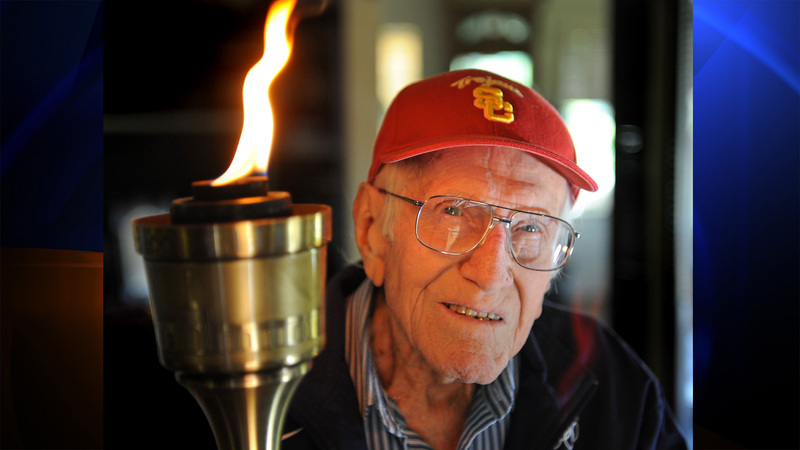 Louie Zamperini lived three lives, and each chapter was nothing short of heroic. Raised by Italian immigrants, at 19 years old, Louie was the youngest American runner in the 1936 Olympics, held in Germany. He was called “speedy” by Adolph Hitler, who asked to meet him after the race. Zamperini was a prime candidate for stardom in the 1940 Olympic Games. The games were cancelled as World War 2 broke out, so Louie enlisted as a pilot instead. His plane was shot down in a matter of months, but Louie survived. He was stranded on a raft in the Pacific Ocean for 47 days. Battling shark attacks, heat stroke and starvation, Louie was finally rescued. From that point on, Louie survived the unsurvivable. From a masochistic prison guard who regularly beat him just short of death, to weeks spent in starvation and isolation, Louie somehow outlived all of his friends. He was reported “killed in action” to his wife and family. Eventually (and shockingly) he made his way home. After a rough transition into normal life, Louie had a brush with Billy Graham, and lived his third chapter as a person of faith. One suspects by looking at his life that God held him long before that. For those who have suffered and feel forgotten, Louie’s life is an example of what God can do when we persevere in our faith. His story inspired me as I wrote about others who suffered and persevered in my upcoming book. So thank you Louie, for a life well lived. Our country was blessed to have you in it. And your life helped make our country what it is. so great to hear from you. I SO hope the future brings us together so you can meet Jere and I can see you and Debbie! :) Yes, Louie Zamperini is a true inspiration.